As orchestral pop has become one of our favorite genres over the past few years, tonight’s tractor headliner has joined our list of favorites. With frontman Ari Picker’s formal training in cinematic scoring, Lost in the Trees is a unique band that takes the incorporation of orchestral elements to a new level. We were lucky enough to chat with Ari in advance of tonight’s performance. What’s the origin of Lost in the Trees? Lost in the Trees began in my bedroom on my 4-track back in the early 2000’s. I used the moniker to umbrella my more arty orchestral songs. While at school, I attempted to get a live band together to play the songs and after a revolving cast of 30 players and years of hard touring, we find ourselves here. We remember the band, or maybe it was an earlier iteration of the band, putting songs out there and prompting filmmakers to contact you for scoring purposes. In what films or TV shows can we hear the band? Early on I was too scared to tour or play out live, so I just pitched my songs to TV and film. I didn’t have a lot of luck, but I did manage to get one song in MTV’s the Real World where one of my songs plays over 2 girls fighting in a hot tub! Were there certain bands that first made you think about adding orchestral elements to your more traditional rock arrangements? Sure! The Beach Boys “Smile” sessions, Pink Floyd’s “Atom Heart Mother,” as well as the Royal Tenenbaums soundtrack, to name a few. Are there particular composers who inspire your songwriting on the whole or with specific selections? Danny Elfman was my first favorite composer and was the one who inspired me to study film music, which lead me to discover Bernard Hermann, as well as many classical composers that I had never heard of. These days I’ve been listening to less film scores and more classical music, such as Beethoven, Shostakovich, and Sibelius. What did you and your cinematic scoring friends think about Trent Reznor winning an Oscar for his work with Atticus Ross on The Social Network? It’s awesome! Such a small group of composers monopolize the Hollywood scoring scene, it’s refreshing when someone does something new. I hope it leads Hollywood to open more doors for new composers, and think outside the box a bit. Given your training and other ties to the film world, what prompted you to move back to North Carolina rather than set up as California band? NC is my home and it always will be. After studying film music, I realized I did not want to climb an LA ladder. I hate the idea of ghost writing or regurgitating other people’s ideas and would rather have folks come to me for being me. Plus, I love the country side and couldn’t imagine living in the city for very long. Are there other orchestral pop bands that you particularly enjoy? I love the orchestrations behind Blonde Redhead’s “Misery is a Butterfly,” as well as all the orchestral stuff that Jonny Greenwood does for Radiohead. The Zombies front man Colin Blunstone has a great solo record called “One Year.” It has some really amazing orchestrations on it. 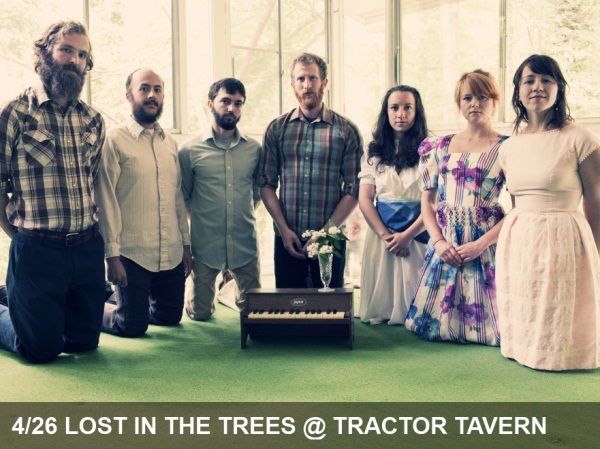 What can those in attendance expect from your performance at the Tractor Tavern? Sean Rowe and I may get into a fist fight! Other than that, we’ll play a lot of tunes from our new record, plus some songs from the record we’re just about to record. There is always lots of good energy… the band really shines through live! What’s next for you and the band in the coming months? Record our new record, tour Europe, and I’ll graduate from college!